Technical Analysis is the study of the behavior of the market and market participants. We try and identify the direction of the primary trend and invest accordingly. As Technicians we can apply our price-focused approach to any market, whether it’s stocks, commodities, currencies or even Bitcoin. If it is liquid and driven by the supply and demand dynamics in that particular market, then applying our methods of price analysis makes perfect sense and it works very well. 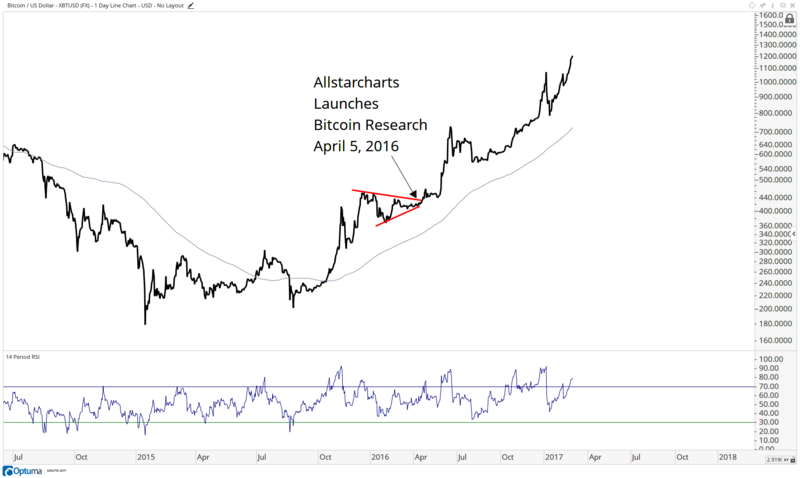 I jumped on board the Bitcoin train last year and added it to my Research Platform. Our clients really enjoy it, whether they are actively trading it or just interested in the product. To be honest, one of the biggest reasons why I decided to start including it in my weekly analysis is because I saw an opportunity to profit from this market. 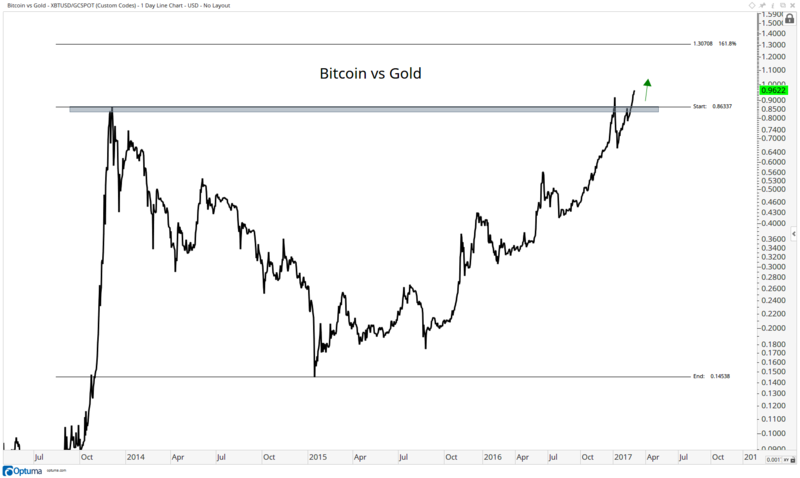 At the end of the day, isn’t that why all of us are looking at these charts in the first place, Bitcoin or otherwise? 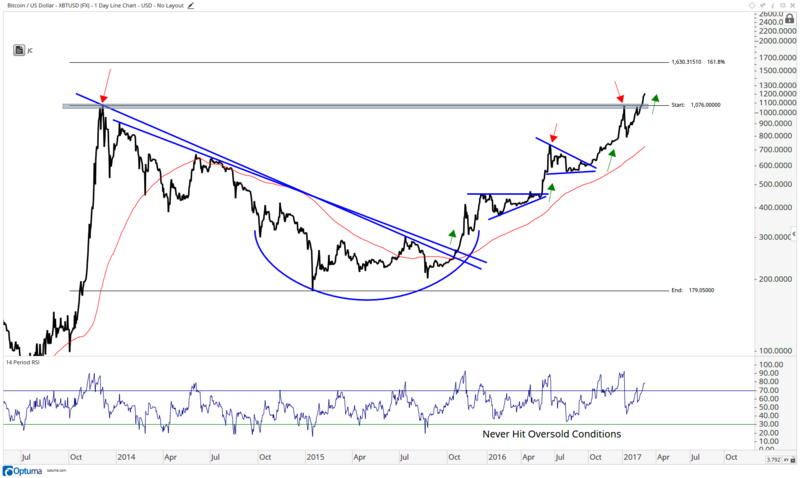 It was April of 2016 and I saw what looked like the completion of a healthy consolidation within an ongoing primary uptrend. So I added it to my arsenal and said let’s do this. My targets up near 660-680 were hit very quickly and even exceeded them. 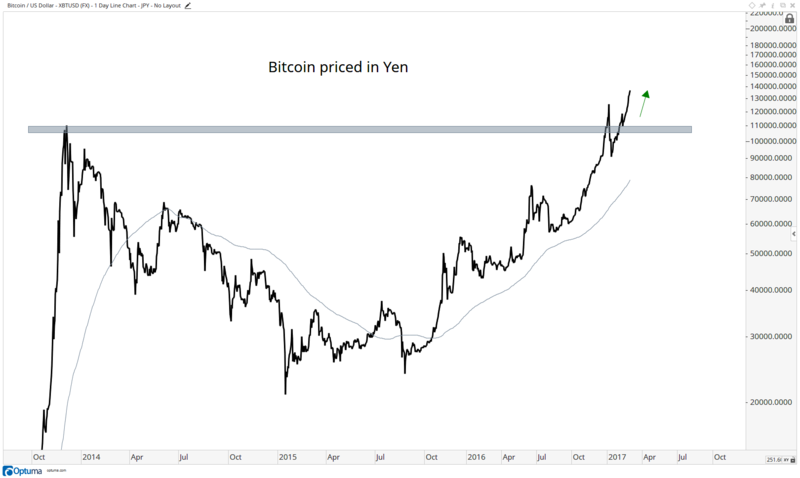 The price of Bitcoin rallied over 60% in the next couple of months following that post. I was hooked! Its amazing how well the supply and demand dynamics work in markets. Bitcoin is clearly no different. 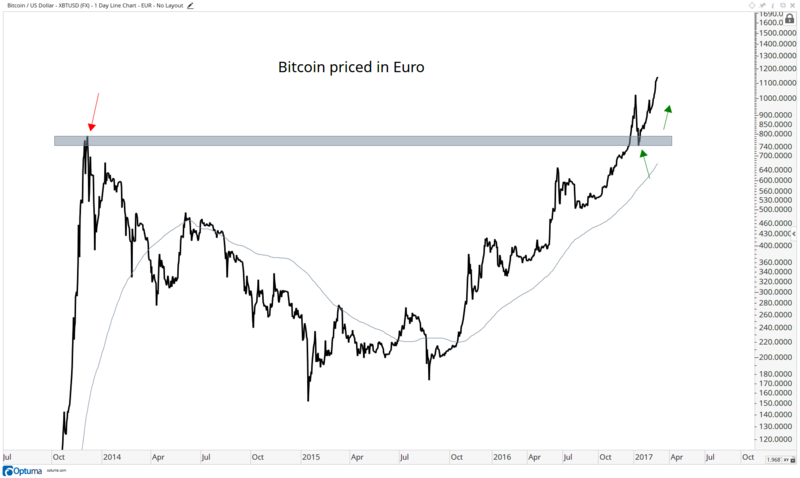 In early January, as soon as Bitcoin ran into that 1075 area, which was former resistance in 2013, the price fell over 25% in just a week. We don’t mind because when our targets are hit, we are disciplined and take profits. Bitcoin is no different. 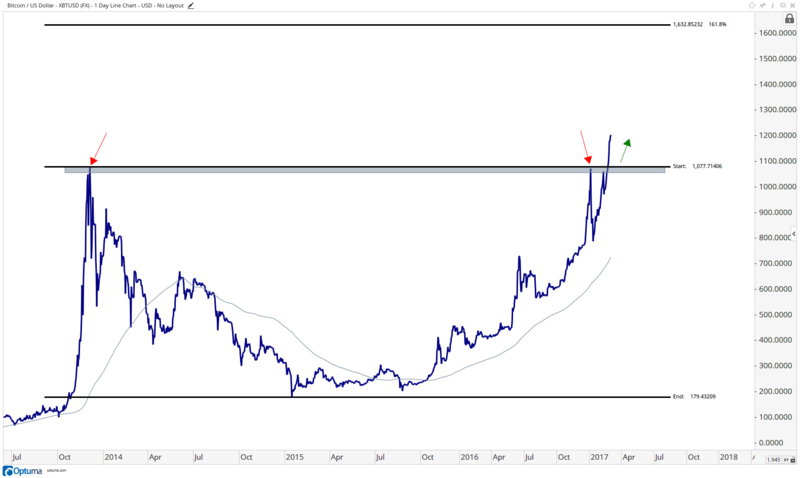 If Bitcoin is below the 2013 highs, then the market is suggesting that the demand has NOT absorbed all of that overhead supply, and therefore a long position makes little sense. So from a risk management standpoint, I’ve made it clear to our clients since last month that we want to be long only if we’re above the late 2013 highs. The upside objective here is near 1630, which represents the 161.8% extension of the entire 3 year consolidation. This is a great market that behaves as markets driven by supply and demand should. We’ve had rallies, selloffs, crashes, rip-your-face-off rallies and everything in between. It is no different than the markets we’re accustomed to trading. The one thing I will say is that the cycles are certainly much quicker. These periods of rallies, crashes and consolidation take place within a much shorter time frame than say something like US Treasury Bonds or the S&P500. So it should be treated that way. It’s a younger market. Much younger. So shorter and more frequent cycles makes sense. 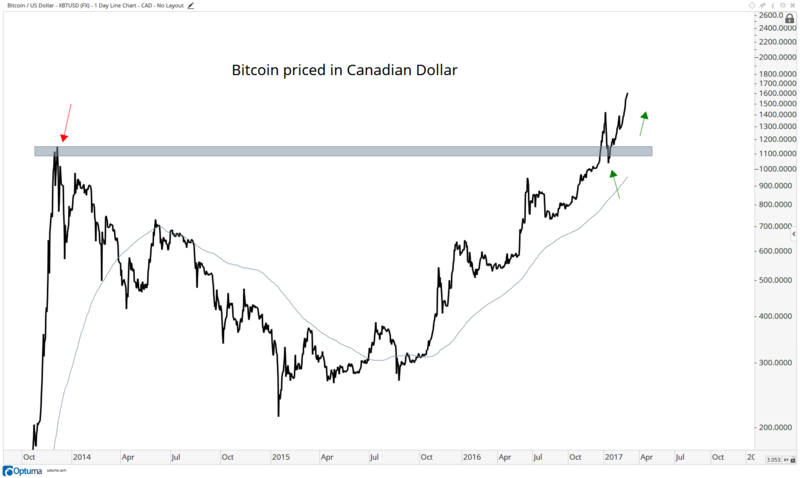 I hope this sheds some light as to how we’ve been able to navigate through the ups and downs in the Bitcoin market over the past year using the same Technical Analysis principles we incorporate into every other liquid market around the world. 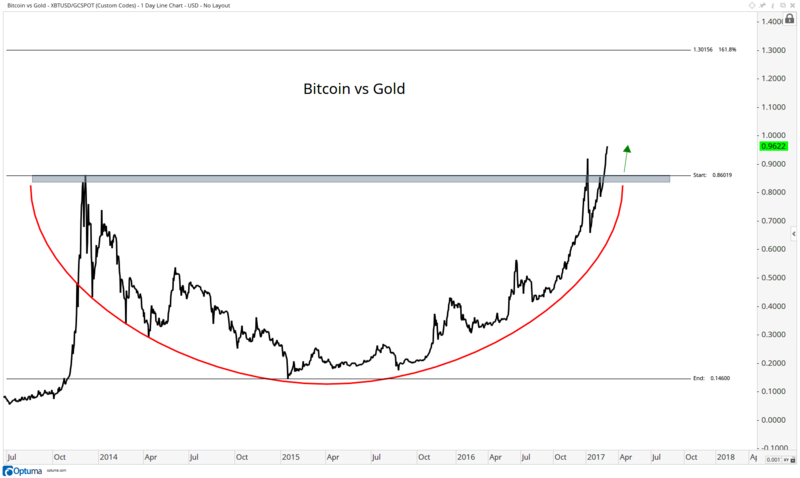 For weekly updates on these Bitcoin charts, sign up here.